Chef Revival H056 Corporate Dispoable Tall Chef Hat 9"
TigerChef > Smallwares > Chef Wear > Chef Hats >< Disposable Chef Hats > Chef Revival H056 Corporate Dispoable Tall Chef Hat 9"
Complete your chef's uniform with the Chef Revival H056 Corporate Disposable Tall Chef Hat 9". This white chef hat provides a crisp, clean look and has a Velcro closure which hugs the head comfortably for a secure fit. 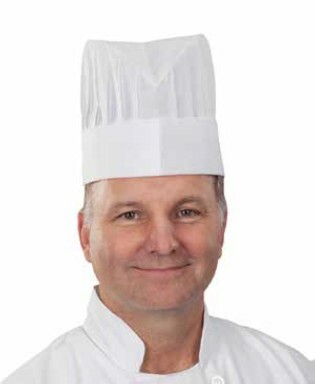 This chef hat is made from non-woven fiber with a vented top to keep your chef cool and comfortable and is disposable for your convenience.